The trial of Israeli soldier Elor Azaria was contentious from the start. He was found guilty of manslaughter for killing an injured Palestinian assailant and sentenced to 18 months. Calls for a pardon prevail. An 18-month prison sentence and demotion to the rank of private: Elor Azaria, the Israeli soldier convicted of manslaughter in the fatal shooting of Abdel Fattah al-Sharif, an injured and unarmed Palestinian knife attack suspect, was handed down by the military court in Tel Aviv on Tuesday. It was far less than the three to five years prosecutors had requested in a case that revealed deep divisions in Israel and dealt with a rare manslaughter conviction of an active soldier. While reading out the sentence, head judge Maya Heller noted that Azaria operated unprofessionally during the incident, and that he violated the army's values. But the panel of judges also took into consideration mitigating facts like the "complicated area." This prompted the jail sentence of 18 months, with 12 months of probation on top of the prison sentence. The defense team plans to appeal the sentence. Ahead of the sentencing on Tuesday, all media outlets in Israel led with stories about the case. 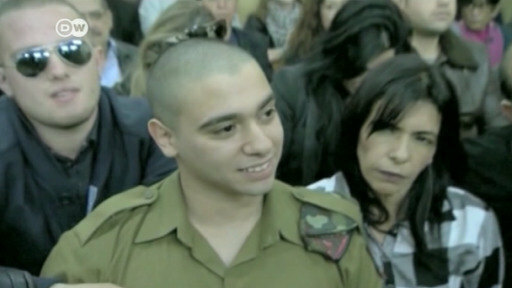 Some commentators argued that Azaria should not have been put on trial in the first place, since many Israelis had rallied behind the soldier. Others argued that there was no way to justify shooting a neutralized assailant, in "violation of orders and regulations." After sentencing, Education Minister Naftali Bennett from the nationalist Jewish Home party reiterated his calls for immediate clemency. "Security of the citizens of Israel requires immediate clemency for Elor Azaria, who was sent to protect us," he wrote in a tweet. Many other politicians joined the call for an immediate pardon. Military observers commented on the relatively moderate sentence: "The critical point is that there was a trial and that it is clear now that even a person who is an assailant has the right to life, you can't just shoot him when he is wounded," Col. Liron Libman, a former chief military prosecutor and researcher at the Israeli Democracy Institute, told DW. In the West Bank city Hebron, al-Sharif's family followed the trial on TV. They had wanted to see the soldier jailed for life and criticized the sentence as too "lenient." Expectations among Palestinians were low as to whether the case would change anything significantly on the ground in occupied Palestinian territory. Senior Palestinian politician Hanan Ashrawi called it a "travesty of justice." Israeli human rights groups, including Adalah, acknowledged in a statement that "Israel usually doesn't indict soldiers," but it also criticized the minimal sentence given, calling it an "expression of disregard for the value of Palestinian life." Others underlined that this case was exceptional: "For us, it is important that there was a conviction at all," said Birte Brodkorb of the Israeli human rights organization Yesh Din. "The trial only happened because everything was filmed." The last conviction of a soldier for manslaughter dates back to a case in 2004.Some observers say there could be other cases that have not been prosecuted. On January 4, a military court in Tel Aviv found Azaria guilty of manslaughter over the shooting of al-Sharif in the West Bank city of Hebron in March 2016. Al-Sharif and another man had allegedly attacked two Israeli soldiers stationed at a checkpoint with knifes. While one was shot dead immediately, al-Sharif was severely injured and lay motionless on the ground. A few minutes later, Azaria, a 19-year-old army medic, shot al-Sharif in the head from a few meters away, surrounded by other soldiers. The shooting was caught on video by a Palestinian activist and published widely by the human rights group B'Tselem, which declined to comment on the sentencing. The video also played a pivotal role during the trial of the soldier. Reading out the verdict, the military judges rejected all of Azaria's claims that the unarmed, injured Palestinian man represented a threat. "We found there was no room to accept his arguments," said the head judge Maya Heller. Azaria believed "that terrorists deserve to die" and shot al-Sharif out of revenge. The army's top brass had condemned the shooting early on. But many others in Israel, where military service is compulsory, said that Azaria was just doing his duty and that he was made a scapegoat by the army. On the day of the verdict, fierce clashes broke out outside the courtroom in Tel Aviv between supporters of Azaria and the police. Some chanted death threats against Israeli Army Chief of Staff Gadi Eisenkot and taunted the judges as traitors. Even before the trial had concluded, politicians from across the political spectrum, among them Prime Minister Benjamin Netanyahu, called for Azaria to be pardoned, effectively taking a different stance than the military leadership. In a flash survey commissioned by Israeli TV Channel 2 on the day of the verdict, 67 percent of Israelis supported clemency, 19 percent were against a pardon. Some military experts were critical of the idea: "He should not be pardoned, it would throw the conclusions of the commanders and judges out of the window," Asa Kasher, a philosophy professor at Tel Aviv University and author of the Code of Ethics for the Israeli Defense Forces, told DW. By law, the convicted soldier has two options to ask for a pardon or a mitigation of his sentence. Active-duty soldiers can seek a pardon from the military command, Chief of Staff Eisenkot. Or he can appeal to Israel's President Reuven Rivlin. The president has already said he will consider a pardon only after all other legal possibilities are exhausted. Israeli President Reuven Rivlin has denied a request to pardon Elor Azaria, who is currently serving an 18-month prison sentence. Azaria was convicted of manslaughter after killing a wounded Palestinian attacker. An Israeli soldier who shot dead a wounded Palestinian attacker has been freed from jail after serving nine months of a 14-month manslaughter sentence. Palestinian groups say Elor Azaria’s early release promotes a culture of killing and bloodshed. A manslaughter conviction against an Israeli soldier who shot dead a wounded and unarmed Palestinian has been upheld by a military court. The case deeply divided Israelis, with some seeing the soldier as a hero.